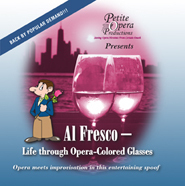 Petite Opera Productions: Petite Opera brings back our favorite geek, AL FRESCO, by popular demand! Petite Opera brings back our favorite geek, AL FRESCO, by popular demand! Opera meets improvisation in this entertaining spoof. 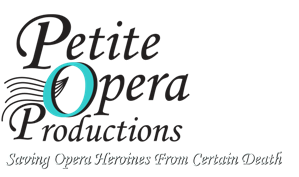 In 2009, Petite Opera was commissioned to create a fun, comic opera that incorporated well-known, lighter opera music into a modern story in English. The goal was to make opera fun and entertaining for all ages. The result was Al Fresco, a first-generation Italian-American from an opera loving family, and self-proclaimed "geek". Experience his comical adventures as he looks for love with modern-day versions of famous opera heroines. This original story with original English lyrics is set to the wonderful music of Sullivan, Mozart, Puccini and others. See for yourself why patrons who saw the premiere begged us to bring it back again. We've even added some new fun twists not originally seen in the premiere. Join us May 6-22! Tickets are $25 for Adults (ages 18-61), $22 for Seniors (age 62 and up), $15 for Students (ages 6-18), and Kids age 5 and under are FREE! Call 847-553-4442 to reserve your tickets for payment by cash or check. For credit card orders, visit our TICKETS page.